A ceremony was held today [Aug 9] celebrating the 50th Anniversary of the 1967 Pan-Am Games, which saw Bermuda make an exceptional showing, besting much larger nations to win medals in football and sailing. 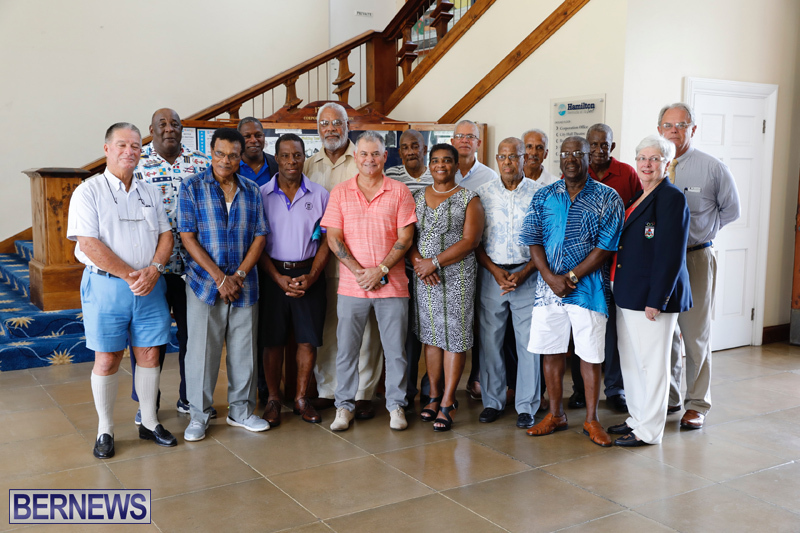 Organised by Glenn Fubler of Imagine Bermuda, the event was held at City Hall with attendees including Hamilton Mayor Charles Gosling, Minister of Social Development & Sports Zane DeSilva, Opposition Leader Patricia Gordon-Pamplin, Bermuda Olympic Association President Judy Simons, Bermuda Football President Association Mark Wade, and many of the 1967 medal winners. The silver-medal winning 1967 National Football Team Pan Am Squad included: Coach – Graham Adams, Clyde Best [then 16 years old]; Clyde ‘Tango’ Burgess; Kenny Cann; Willis Cann; Gordon Cholmondeley; Gladwyn ‘Bubba’ Daniels [Captain]; Gary Darrell; Carlton ‘Pepe’ Dill [5 goals]; Marcus Douglas; Earlston ‘Duckfoot’ Jennings; Ed ‘Tinty’ Ming; Rudy Minors; Leroy ‘Nibs’ Lewis; Irving ‘Jack’ Romaine; Noel Simons; Lionel ‘Baldy’ Smith; Rudy Smith; Winston ‘Coe’ Trott; and Dennis Wainwright. On their way to winning the silver medal, the Bermuda football team defeated the USA by a score of 7–3. In addition to the tremendous showing in football, Bermuda also captured a medal in sailing, with Eugene ‘Penny’ Simmons winning a bronze at the 1967 Pan Am Games. CONGRATLATIONS THE 1967 FOOTBALL & SAILING TEAM. YOU ALL + ORGANIZERS ARE STILL WINNING TODAY, DOING GOOD THINGS FOR THE SPORT & BERMUDA.